Sheet metal hand seamers are specialty tools that let you bend, flatten and crimp sheet metal and non-ferrous metals with precise control and power (Source). 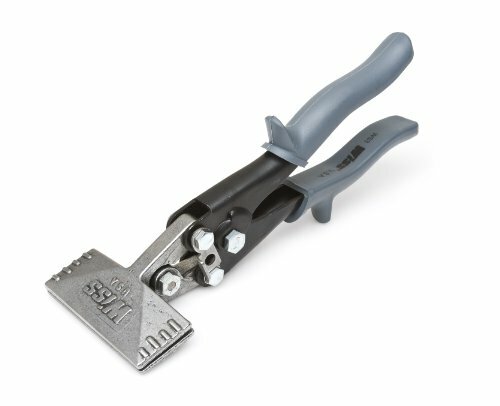 These specialty hand tools are primarily used in the metal trades, including but not limited to roofing, residing, commercial HVAC installations, and commercial building environments (Stortz). ​The American-made (source) Klein Tools Hand Seamer is the best of the bunch- its jaws measure 3" wide and 1.25" deep. They are a bit pricier than other options, but reviewers we spoke with endorsed the quality of their build and their smooth, powerful operation. The Klein sheet-metal hand seamer uses compound-leverage to help its users bend, crimp, seam and flatten non-ferrous metals, including sheet metals. It folds 22-Gauge cold rolled sheet metal (CRSM) and 24-Gauge semi-solid metal casting (SSM) metal. Its jaw is marked with 1/4-Inch (6mm) increments, enabling measurement precision. Overall, this is a solidly built hand seamer. It's handle is easy and comfortable to the grip and since it is nickel-plated it doesn't rust or corrode. Buyers describe using it on sheet metal, as well as on heavier grade metal surfaces, saying that because of its smooth finish it doesn't scratch or mar sensitive, metal surfaces. Let's take a look at 5 of the best-selling sheet metal hand seamers on the market today and see how they compare. This sheet metal seamer offered by Apex Tool is sturdy, reliable and efficient. Users love the high quality, but some do note that they have problems with the locking mechanism. This hand metal seamer measures 11.3 x 3.3 x 2.9 inches and it has a weight of 1 pound. It features a jaw width of 3 ¼-inches, a maximum seam depth of 1 ¼ inches and a ¼ inch depth marking. The 3-inch straight handle provides optimal handle span for maximum power and for ensuring a comfortable operating range. Overall, this hand seamer is useful for anyone that wants to bend and flatten metal. A customer comments that he has been using the Apex hand metal seamer frequently and that it’s an essential part of his tool bag. The reviewer mentions that the seamer works smoothly, precisely and efficiently. Another buyer shares that he used the metal seamer on 20 gauge steel framing members and that he didn’t have any problems. He adds that the tool will last for years. A purchaser states that the sheet seamer grips metal evenly and that he likes the alignment marks. He would recommend it to anyone in need of a high-quality metal seamer. However, some customers have complained that the seamer rusts quickly and that it requires a lot of force to make it work. A user also states that the seamer is misaligned and that the jaws are not even on the top. This 6-inch jaw sheet metal seamer offered by Pittsburgh is practical, convenient, and easy to use. Users love the price and the size of the seamer, but some do note that the jaws don’t close all the way. This straight metal seamer measures 11.6” x 7.5” x 4.5”, and it weighs 2.1 pounds. It features a compound leverage design for better control, a powerful grip for quick bending and flattening. The 6-inch seamer is made of heavy-duty steel construction, and it has a jaw width of 5- 15/16 inches, maximum jaw opening of 1-11/16 inches, and a maximum handle opening of 6-7/8 inches. The jaws are marked in ¼ inch bending increments. In general, users have a mixed opinion regarding the Pittsburgh sheet metal seamer, and they agree the quality of the material should be improved. A customer shares that the jaws don’t close tightly and that you can’t hold a narrow quarter of an inch piece with it. The reviewer adds that he is very disappointed with the quality of the seamer and that he doesn’t recommend it. Another user mentions that the hand sheet seamer works adequately, but it’s nothing special and it won’t last very long. An unhappy buyer also adds that the edges are not even and that no matter what you’re bending, the seam will be uneven. On the other hand, a satisfied customer states that the hand seamer works great and that he didn’t have any problems bending metal roofing trim. If you need a straight hand seamer of high-quality, you might take a look at this sheet metal seamer offered by Klein Tools. Users love that the handles close firmly, but some do note that it’s expensive. This straight metal seamer measures 8.4” x 4” x 1”, and it has a compound leverage design for an accurate and powerful grip. The seamer also features a broad jaw for wide folds and a heavy-duty handle. The jaws are placed in ¼ inch increments for precision, and you can fold 22-gauge CRSM and 24-gauge SSSM with this metal seamer. In general, buyers are extremely satisfied with the functionality, performance, and usefulness of the Klein straight hand seamer. A purchaser comments that this is a solid and well-built seamer and that it doesn’t bend or flex like similar products. The reviewer also adds that he uses it for heavy-copper flashing and it works smoothly. He also mentions that it doesn’t leave any marks or scratches on copper. Another happy buyer comments that this metal roofing tool is comfortable, light and efficient and that it’s the best sheet metal seamer available. A user also states that the handles close firmly and that the edges of the seamer meet flush. But a customer complains that the clamping action is inaccurate and that he expected a tighter fit. This 3-inch hand metal seamer offered by Malco is well-designed, durable, reliable and easy to use with one hand. Users love the comfortable grip, but some do note that they have problems with the handles. This metal sheet seamer measures 12.8” x 4.2” x 4.5” and it has a weight of 2.05 pounds. It features an ergonomic handle, a non-slip grip, and a unique one-hand operating latch. The design ensures easy open and close latch motion and maximum handle leverage. As a whole, this is a high-quality seamer suitable for various types of metals. 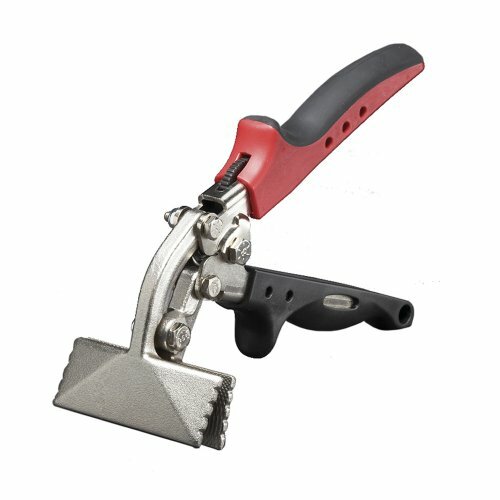 A buyer comments that the Malco Offset hand seamer has a powerful bite and a heavy-duty design and that he highly recommends it to novice metal sheet workers. Another user states that this sheet metal seamer is extremely useful for HVAC installation and that it’s easy to use it without employing too much force. The reviewer also adds that this metal roofing tool is comfortable to hold and an excellent choice for any professional. A satisfied purchaser comments that this is the best sheet metal seamer that he has ever owned and that it does the job quickly and smoothly. However, some customers have complained that the plastic handles slip continuously and that it broke in half after a couple of months. This 6-inch hand metal seamer offered by Malco is expensive, handy and suitable for novice sheet-metal workers. Users love the 6-inch wide jaws, but some do note that the handles are problematic. This sheet metal seamer measure 0.1 x 7 x 4 inches and it has a weight of 1.8 pounds and a bending depth of 1-¼ inch. The seamer also features drop forged jaws made of high-impact steel, hardened steel handles, a compound leverage design, and rust-resistant nickel plating. It has non-slip vinyl grips for improved control and the wide jaws minimize the buckling and bowing of the metal. In general, users have a high opinion of the Malco hand metal seamer, and they praise its functionality, performance, and depth. 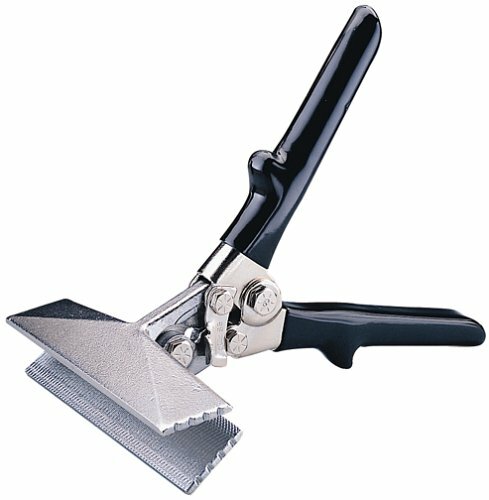 A buyer comments that he uses this sheet metal crimper to do vinyl installations and that the seamer is easy to use and does the job quickly. Another satisfied customer mentions that he uses the Malco hand seamer to bend soffit and fascia and that it would last for years without suffering any damage. A happy user also adds that he has been using this seamer machine for the last couple of weeks and that he didn’t encounter any problems. He would recommend it to anyone looking for the best hand seamer available. However, some customers have complained that the handles start to slip with time. The first pair of sheet-metal pliers we looked at is manufactured by the Apex Tool Group. Apex says that they are designed to be able to flatten and bend sheet metal, engineered with a handle span optimized to generate a solid amount of power all while remaining comfortable to use. They feature a 3.25-inch jaw width and a 1.25-inch depth. One buyer when we spoke with told us that they are spring-loaded, meaning that they open by themselves when the latch isn't closed about .5 inches. A service professional who hauls around a large toolbox says that these sheet metal crimping tools are essential to perform his job- saying that they are an inexpensive, durable and trustworthy option in his experience. However, one carpenter we interviewed told us that his tools experienced extensive rusting after several weeks. While the rust is bad enough, the other negative aspect is that the rust transferred onto the materials he was working with. Another reviewer told us that they were displeased with the locking mechanism on these vise-grips, saying that it was highly difficult to operate- they are uncooperative to unlock and require a tremendous amount of force to re-engage the lock. Another buyer told us that he received jaws that were misaligned-saying they're not completely even on the top edge. The second straight sheet-metal seamer we took a look at was manufactured by Pittsburgh. Pittsburgh says that they have designed this compound leverage tool to let you flatten, bend, crimp and easily grip sheet metal surfaces. They have designed it to include forged jaws that display .25 inch bending increments. There is some mixed feedback for these Pittsburgh sheet metal tongs, with buyers saying they received seamers who's jaws are not machined well and don't completely close. The third option we examined was the U.S.A.-made, Klein tools 86553 straight hand seamer. Klein Tools advertises its straight hand seamers as an effective way to work with tubing, ductwork and sheet metal- saying that it provides a powerful grip suitable for heavy-duty purposes- a great siding hand tool, for example. Its compound-leverage operation is designed to efficiently and accurately flatten, seam and band non-ferrous and sheet metals. Handily, the jaws are demarcated with a .25 inch increments so you can be assured that you get precision bending in its vise-grip. The width of the seamer it is 3 inches and it's depth as of 1.25 inches. Most buyers were broadly satisfied with this pair of specialty hand tools, saying that it functions well and has an attractive finish that is resistant to rust. Other buyers told us that unlike other brands that produce a cheap quality of work tools, Klein Tools has manufactured a pair of straight seamers that doesn't have a tendency to flex or bend, providing a comfortable rubberized handle for ergonomic comfort while vise-gripping sheet metal. Another electrician we interview told us that Klein Tools is renowned in his profession for producing high-quality, sheet-metal handtools and so he was trust thing when he purchased this option- saying that it is machined well, with the tool's flat edges meeting flush and square, unlike other options that don't close tightly. The fourth pair of sheet metal pliers we examined was produced by Malco-they advertise their hand steamers as designed with offset handles to provide electricians and all other service professionals a strong and comfortable grip even in the most difficult and challenging work circumstances. Indeed, since these sheet-metal pliers are manufactured to provide one-handed operation, buyers have found that they are especially easy to open and close, leaving you one free hand to stabilize the work surface you are operating on. Non-slipping handles are designed to decrease the incidence of hand fatigue, letting you maintain a strong and even vise-grip over the course of the job. Most buyers expressed broad satisfaction with this pair of sheet metal pliers, saying that they provide power and a heavy-duty build useful for professionals or even home-repair DIY types. One buyer told us that they are a solid option if you are looking for sheet-metal tongs that are not poorly designed but not the most expensive, commercial option on the market. The last option we looked at was the Melco 6-inch sheet metal tong- it has extra large forged jaws with 1.25-inch bending depths that provide effective and powerful compound leverage. They are drop forged and built from high-impact steel- with hardened steel-constructed handles designed for durability in rough and inclement work environments. The extra wide jaws are designed to decrease the chances of the metal you're working on bowing and buckling, letting you perform the same amount of work in a fewer strokes to straighten or bend sheet metal. Malco advises that their hand seamers are equipped to work in a variety of different professional service capacities including remodeling, commercial building environments, for roofers and residing as well as HVAC installers. Cushioned grips are designed to provide the sheet-metal hand tool comfortable operation while utilizing compound leverage to provide powerful and smooth action. 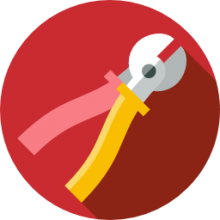 One vinyl siding installer we spoke with says he has been satisfied using this sheet-metal hand tool- as a specialty tool, it's been indispensable to getting remodeling jobs done. Another reviewer who works in the arts and crafts trade told us that he uses this tool on a daily basis, saying that for operating on sheet metal this is a valuable option suitable for beginners as well as professionals that require a commercial-strength plier.